Bargain-hunting tourists planning last-minute Easter getaways have been told where to get the most and the least for their money - as currencies fluctuate worldwide. The exchange rates of South Africa, Argentina, Japan, Egypt, Jamaica, Sri Lanka and the Czech Republic are now appealing to British holidaymakers. Tourists visiting countries on the continent who use the euro plus those trading in local currencies such as Sweden, Norway, Turkey and Bulgaria will notice big shortfalls in the wake of currency crises. America has unfavourable rates too, the study suggests. Britons visiting South Africa should get more than 17% more rand for their spending money than this time last year. The pound has grown 11.7% against the Argentinian peso and 11.6% against the Japanese yen, meanwhile, giving consumers more money to spend on things such as gifts, accommodation and worldwide travel insurance. 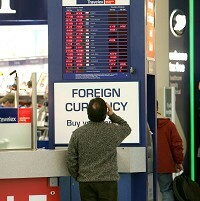 Tourists will get far fewer euros and dollars to the pound than even a month ago, however. The pound has fallen 5.4% against the euro and 5.5% against the US dollar since March 2012. These latest figures come from Post Office Travel Money. High demand for Brazilian holidays is expected in 2013 - before prices rise with the arrival of football's 2014 World Cup.